Since Microsoft has done away with the Start menu in Windows 8, finding all of the apps you have installed is a new process. 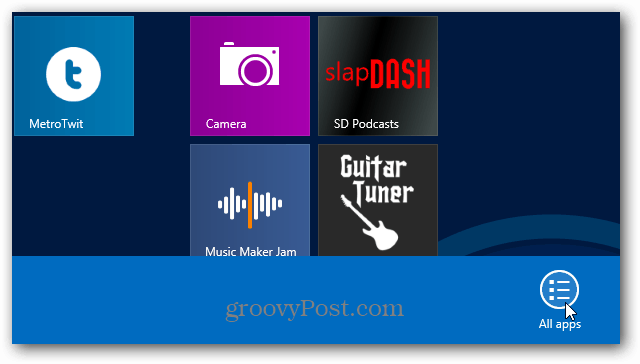 Here’s how to do it on a computer or Windows 8 tablet. 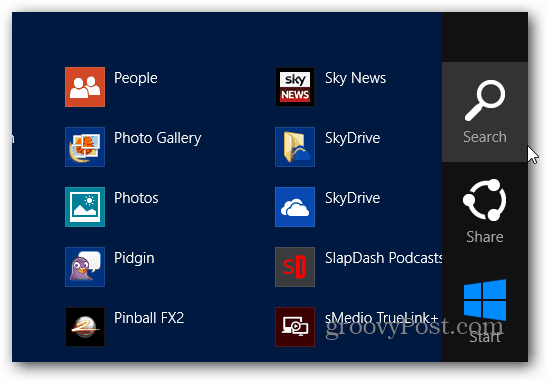 Note that this article has been updated to show how to find all installed apps on Windows 8.1, which is a much easier process. 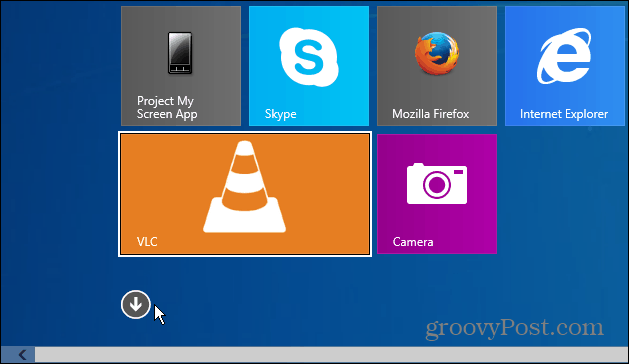 While the instruction for Windows 8 is still the same, since Microsoft update the OS to Windows 8.1, finding all of your apps has become much easier. From the Modern Start screen, simply click the down arrow button, or if you’re on a touch screen, swipe from the bottom up. There you will get your apps list. 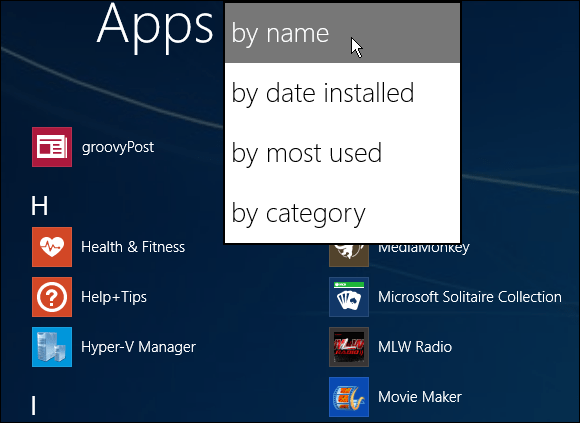 And another new feature is you can organize the apps by name, category, most used, or date installed. 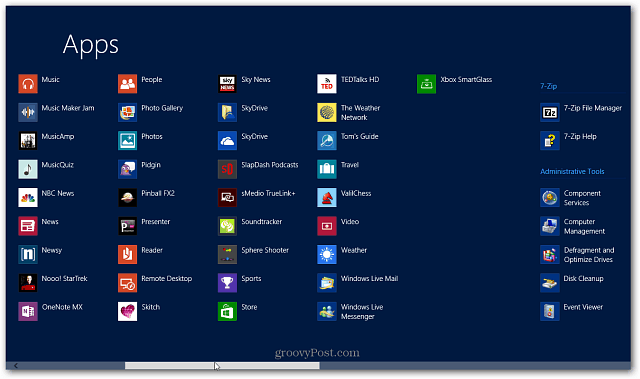 If you want an easy way to find all apps installed on Windows 8 computers, hit the Windows Key + Q in from either the desktop or the new (metro) interface. This brings up the Search box and will display all of the apps. The benefit of this is you can easily start searching for a particular app too. Or on the Start screen, right click an empty area then click All Apps at the bottom. If you’re using a touch screen, swipe from the bottom up to see All Apps and tap it. 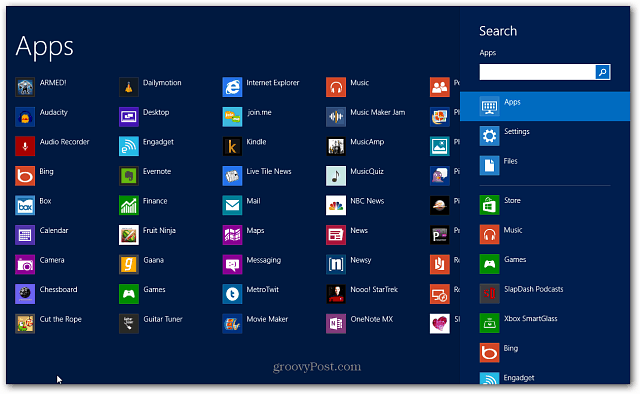 This will display all of the apps and you’ll need to hit the Windows Key + Q to use Search. Or on a touch screen, swipe from the right side of the screen to the left to bring up the Charms, then tap search. How do i locate my correct type program and also to print, what do they mean print from apps. hopw do i do that when i have something come up i have to print and it will not let me.